can Frogger teach us ecology? What can Frogger teach us about ecology? I’m sure most of you are familiar with the Konami video game Frogger that first appeared in arcades in 1981. I’ve certainly burned my fair share of quarters on this game – despite my significant lack of video game skills – just for the fun of it. But, I’ve been wondering lately, could one of the most iconic arcade games of the 20th century also be a good teaching tool for ecology and environmental studies? Could one of the most iconic arcade games of the 20th century also be a good teaching tool? I definitely learned a lot of arithmetic back in the eighties from the computer game MathBlaster (which I’m excited to see is now available in its most recent incarnation for free at www.mathblaster.com) and a lot of geography in the nineties from Where in the World is Carmen Sandiego. Have we biologists dropped the ball on creating educational games that are also fun and broadly appealing? I think some biocreativity may be in order here! As-is, Frogger can help teach some of the basics of ecology. Mr. Frogger, of course, likes to eat insects, has a habitat preference of lily pads near stream banks (preferably far away from cars) and enjoys the company of lady frogs. Major causes of mortality are apparently vehicles, alligators and snakes. I forgive the game a few inaccuracies, such as frogs die when they land in water and turtles are as large as Volkswagens that travel in packs of three. These days, I think a re-vamped Frogger could be really useful in illustrating how big of a threat roads actually are to amphibian populations. To get serious for a minute, several recent reports – including a 2007 paper by research geographer Alisa Coffin in the Journal of Transport Geography – indicate that road-associated mortalities may be the number one cause of wildlife mortality in the United States. 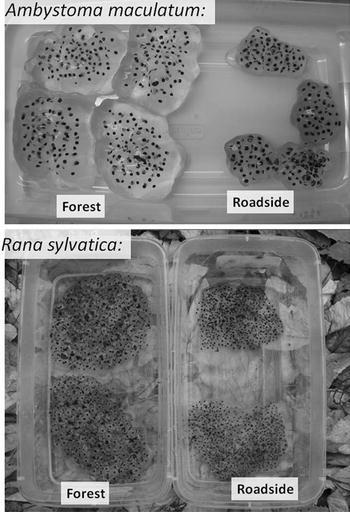 Photographs of egg masses of a salamander (top) and wood frog (bottom) from forest and roadside pools in the Adirondack Mountain Region of New York from Nancy E. Karraker & James P. Gibbs' 2011 paper in the journal Hydrobiologica (Volume 664, Number 1, pgs 213-218) entitled, "Contrasting road effect signals in reproduction of long- versus short-lived amphibians". Roadkill has been the topic of several recent news articles and blogs by National Geographic, The New York Times and New Scientist. In fact, the problem of roadkill is so serious and understudied that The University of California at Davis recently formed the Road Ecology Center, dedicated to the emerging field of “road ecology”. Think roadkill is only a problem for wildlife? Think again. A 1991 article in the medical journal Pediatrics by Dr. Mark Windome used Frogger as an illustrative tool to describe the significant threat traffic crossings have on juvenile human survivorship (a problem that still abounds)! Roadkill isn’t just on major highways, it even extends to protected areas. The photo below, for example, was taken along a relatively quiet park road between Buescher and Bastrop State Parks in Bastrop County, Texas. 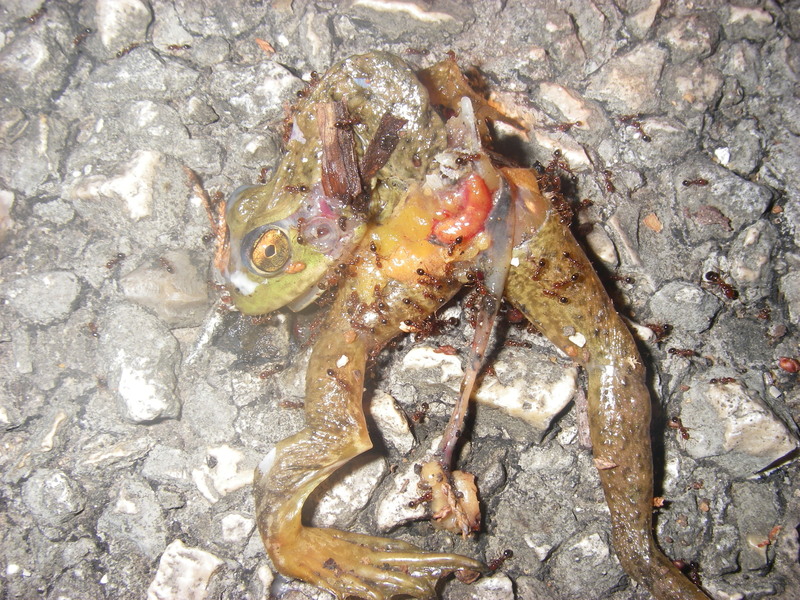 During a spring field trip in 2009, there were hundreds of roadkill frogs along Park Road 11 (this is “protected” habitat, folks!). Interestingly, the frog carcasses were all dominated by red imported fire ants (Solenopsis invicta) and could be facilitating the spread of these ants by providing convenient food supplies. Unfortunately, Frogger isn't all fun and games. This particular individual made a meal for a colony of invasive red imported fire ants (Solenopsis invicta), potentially facilitating their spread. This photo was taken in a protected state park in Texas. Photo by H. Gillespie (2009). So what’s being done about road mortality? In a real-life examination of Frogger’s plight, Dr. Tom Langen and colleagues studied amphibian and reptile road mortality in upstate New York (reported in a 2009 article in the Journal of Wildlife Management). By simply recording when and where amphibian roadkill occurred, these scientists were able to identify “hotspots” of amphibian road mortality. These hotspots, mostly located where wetlands came within 100 meters of the road, can be used to determine where to place wildlife barriers, underground crossing tunnels and signs warning drivers to slow down and watch out. Knowledge of hotspots can even be used to predict and avoid where roadkill may be greatest when planning new roads. All too often, however, the burden of “doing something” about roadkill falls to local citizens and organizations. For example, many citizen groups around the country have started amphibian crossing projects in their communities, to assist Frogger in crossing safely. Other groups also collect roadkill data through educational programs such as The Roadkill Project started by a professor from Simmons College in Boston to teach his students about wildlife and road mortality. Many state and regional programs throughout the country are now following the lead of the California Roadkill Observation System, by creating online networks for citizens and scientists alike to photograph, identify and map wildlife roadkill. A handful of artists have made roadkill awareness their platform of choice including Pennsylvania photographer Joy Hunsberger, whose work focuses on portraits of roadkill animals, and University of Central Arkansas art instructor Carey Voss who constructs papier-mâché models of roadkill animals filled with wildflower seeds that she installs on country roads. Some artists are taking things even farther, including British artist Adam Morrigan who literally creates art out of roadkill near his home using indigenous methods of taxidermy. There are also some clever biocreative projects coming from groups such as the W.A.T.E.R. Institute at the Occidental Arts & Ecology Center in Sonoma County, California which produced the faux-news video below to raise awareness of the effects of roads on migrating California tiger salamanders. One of my favorite instances of Frogger-related biocreativity is from a couple of technology hackers who created a remote control Frogger with a Roomba vaccum cleaner and drove it across 6th Street during the SXSW festival in Austin, Texas back in 2006. I’m fairly certain it wasn’t in the name of roadkill awareness. Interested in throwing your biocreative hat in the ring? Save The Frogs, a non-profit organization dedicated exclusively to amphibian conservation, hosts annual art and poetry contests to raise awareness of Frogger’s plight. The submission deadline is October 15, 2011. An entire page of the Save the Frogs website is dedicated to increasing awareness of the effects of roads on amphibians. 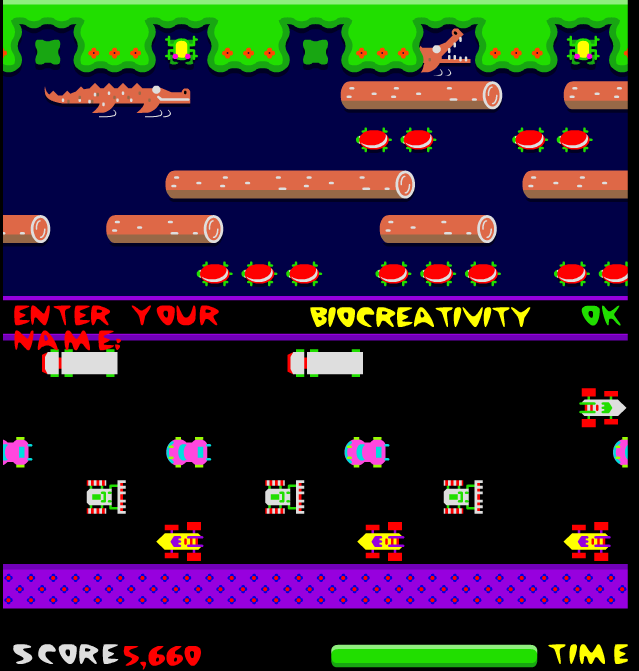 Getting back to Frogger, can popular video games be one way to increase science literacy? In this high-tech era it is becoming increasingly easy to design games and apps that could be used for this purpose. Perhaps there is a biocreative programmer out there who could design a new generation of Frogger that would educate players about road ecology, with a broader emphasis on many species and the diverse impacts of roads on wildlife. What if such a game could be come as educational as it was popular? While we’re waiting for that to happen, you can play Frogger online. And, if you want to be impressed by wicked Frogger-playing skills (i.e. not mine), you might enjoy this video. What biocreative games have you discovered that may help increase scientific literacy?